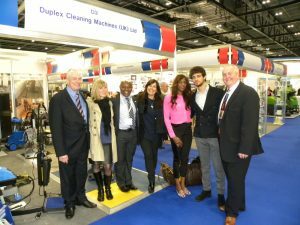 Our picture shows the team at The Cleaning Show at London’s Excel earlier this week together with visitors from Italy. The show was busy every day with lots of interest in the Duplex range and a chance to catch up with old friends and plenty of opportunities to make new contacts in the cleaning industry. Our stand featured the Duplex 620 Steam which was nominated for the Innovation Award, the Escalator 550 Professional, the Jet Steam Professional, the Duplex 420 Steam and the Jet Vac Ultima.